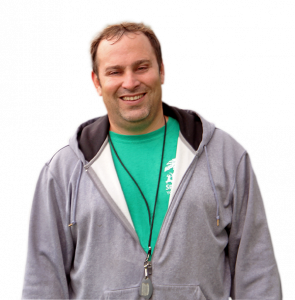 Michael Schaffnit began working at Spaulding Youth Center as a 1:1 aide in 2009. He had been looking for a new job and was convinced by his brother (also a Spaulding employee) to join the organization. Michael told himself his employment at Spaulding would only be temporary. However, once he started working with the students and dedicated staff members, he knew Spaulding was where he belonged. As a paraeducator, Michael’s current responsibilities include helping the residential student he is working with successfully tackle his morning routine to get ready for the school day. He helps the student brush his teeth, comb his hair and get dressed. Once ready, Michael and the student head to school where he assists with academic work, art projects, culinary lessons and more. When the opportunity arises, Michael also accompanies the student during vocational activities in the community. This type of real-life experience provides students with the skills they need to one day enter the workforce with knowledge and confidence that leads to success. When asked about his favorite thing about Spaulding, there is no hesitation in Michael’s response: the kids. He enjoys interacting with them and getting to know who they really are as people. He recognizes the great work the organization does for its students and notes that its determination to better the lives of each and every child enrolled has not changed since he began his journey here almost 10 years ago. For a new Spaulding employee, Michael suggests seeking out veteran staff for advice since they are always willing to help in this team-centered culture. Also, be patient with yourself and you will find your own style for supporting the exceptional children of Spaulding. It appears Michael certainly has found his way since he earned recognition as the 2018 Support Staff of the Year. In his spare time, Michael enjoys playing on a co-ed softball team and spending time with friends and family. He is also about to welcome his first baby – another new beginning and challenge for which he is ready!